In December 1998, my wife decided that she wanted to buy a station wagon. It would be the perfect vehicle for our family of four. We settled on a 1992 Ford Taurus wagon at Winebarger Ford. The salesman and part owner, William, assured us that the station wagon we picked out was a one-owner, local vehicle, and that his dealership had done all the service and regular maintenance on it since it was new. (This turned out to be a lie - the car was previously owned by "The Piedmont News Channel" (which is now WGHP Fox 8), and says so down both sides of the car where the 8 inch high letters used to be, when the sun hits it just right. My 7-year old pointed it out a few months ago - I'd never noticed it before!). William seemed very nice and honest at the time and, unfortunately, my wife and I believed him. We secured a $3000 loan from our bank and bought the car. We returned to Winebarger Ford every 3,000 miles for regularly scheduled oil changes. At the end of April 2000, we took the car in for an oil change. The car started smoking and leaking oil immediately thereafter. (It had never leaked or smoked until this time). We called Winebarger's about the oil leaking and smoking. We were told that it was just coming from where oil was spilled when the car was serviced, and would burn off in time. When May came, the car was still leaking and smoking. I called Winebarger's again, then my wife returned with the car to the dealership. She had a mechanic (Odell) ride in the car to see what the problem was. The mechanic said it was just a loose radiator cap and sent my wife on her way. The car was still leaking and smoking and taking a quart of oil each week. At the end of May, the car was still leaking and smoking. We called Winebarger's and insisted that they needed to look at the car again. We were told to bring the car back in the next week and they would look at it. At the beginning of June, we took car in once again. The mechanics put the car on the lift and determined that there was oil leaking from the back of the engine (Surprise!). We were told that the oil pan gasket was the problem. They were too busy to fix it and we had to come back in a week. On June 13th, We took the car in for the oil pan gasket replacement. We were told this would fix the oil leak. I supplied a top-of-the-line Fel-Pro oil pan gasket (I was trying to save a little bit of money by picking the gasket up myself at AutoZone). The mechanics determined that a motor mount was broken and replaced (?) it also. When we went to pick up the car, the bill, which had been altered, stated that there was no warranty on the gasket replacement, as I supplied the gasket. This was not explained before repair - If it had been, I would not have supplied the gasket. Also, the 'new' bill, or work order was neither approved nor signed by my wife or myself. Click here to look at the bill. At the end of June, the car was still leaking and smoking the same as before. It was still taking a quart of oil per week. We called Winebarger's again and were told the same story as before: The oil dripping and the smoking was coming from where oil was spilled during the service and that it would burn off in time. 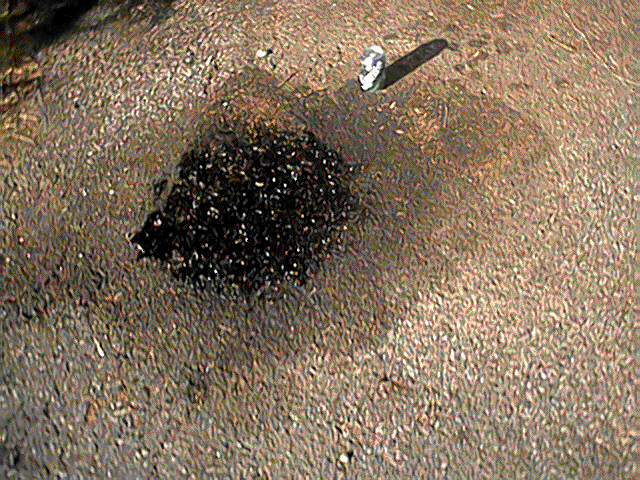 The picture below shows what our driveway looked like AFTER the oil leak was 'fixed' by Winebarger's. Take note of the Sprite can in the picture to get an idea of the size of the problem. At the beginning of July we called Winebarger's again. (We wanted to make sure the car was OK before leaving on vacation). I was very insistent (rude) about the car still not being fixed, and was told in a similar manner that the car WAS fixed and that there was nothing wrong with it. On July 9th, being fed up with dealing with Winebarger's and praying for the car to make it, we left for vacation at the beach and made it as far as Cary, NC, which is next to Raleigh. Smoke was coming from under the car so thick that you couldn't see behind the car. We pulled off at the Cary exit and made several long distance phone calls trying to reach William, Cecil, Johnny, Larry, Steve, or anyone else associated with Winebarger's. We were forced to rent a hotel room for the night. We finally reached Cecil. He suggested that we call the local Ford dealer in the morning and he would get them to fix it. The local Ford dealer was booked up for more than a week. We called Cecil back. He suggested that we take it to the Goodyear Service Center (the nearest garage) and call him back to let him know what the problem was and what it was going to cost. Goodyear determined the problem that Winebarger's had failed to fix was a bad rear main engine seal. We were also told that since the leak started immediately after the oil change, it was probably due to the oil being over-filled. When Cecil was called again and told what the problem was, and that it would cost in excess of $700 to fix it, he suddenly changed his tune and denied any responsibility for the problem. Not wanting to miss out on our only family vacation of the year, we left the car with Goodyear to repair and rented a mini-van to continue on our beach vacation. We picked up the car on the return trip and made it home safely. That's when the fun, legal stuff began.